The overall design of the backdrop was modeled on our Stations of the Cross, which allow for the inclusion of the architectural elements of an arch, inset pattern, and columns. The arch was designed with a projection that allows for the sanctuary wall to now be softly lit by hidden lights. Taking greater advantage of the ceiling height of the church, the arch also no communicates a greater sense of verticality, which is a traditional element in church architecture. The motto over the arch reads Ad Majorem Dei Gloriam, which is Latin for “To the Greater Glory of God.” This motto sums up our purpose in beautifying our sanctuary – that our worship may give greater glory to God – but it also reminds us of our Catholic heritage in Montana. “A.M.D.G.” is the motto of the Jesuit order, and it was in the Fall of 1840 that a Jesuit priest, Fr. Pierre DeSmet, offered the first Mass in Montana, followed by the Catholic evangelization of the area by Jesuit priests at the request of the native peoples. Three fleur de lis symbols adorn the upper part of the arch. This has multiple levels of meaning: as a French symbol the fleur recalls the fact that both the first priests in Montana as well as our first bishop were French-speakers; as a stylized lily it symbolizes Mary, the “lily among thorns” of the Song of Songs; as a decorative element they harken to the many fleur de lis’ that decorate the interior of our mother church, the Cathedral of St. Helena; in their number (three) they symbolize the Trinity whom we worship -Father, Son, and Holy Spirit. The body of Jesus on the crucifix is now larger and more visible, and is hung against a red background which reminds us of Jesus’ blood that was shed on the cross for our sins and offered to us in the Sacrifice of the Mass, which is the re-presentation of that very same sacrifice throughout time. 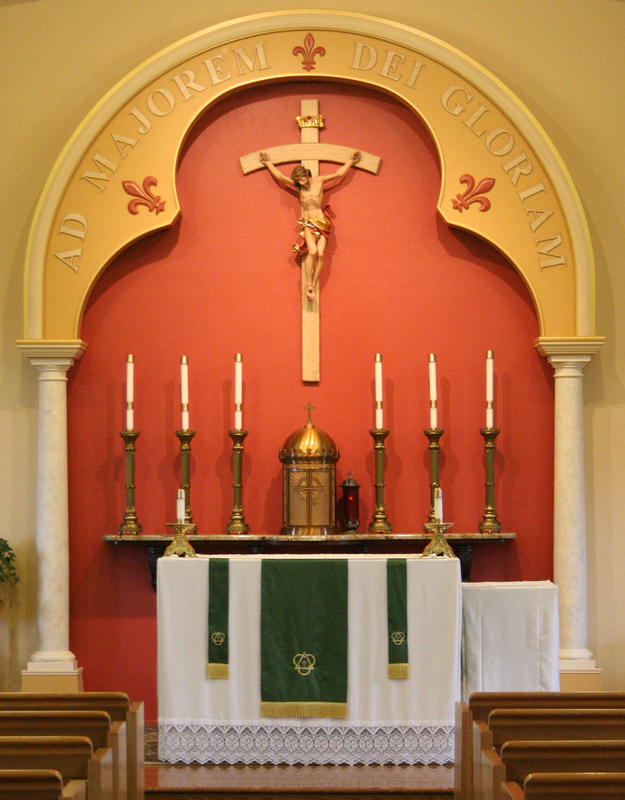 The “altar of repose” upon which the tabernacle sits is made of a solid piece of polished granite, supported by corbels in which are carved clusters of grapes – yet another symbol of the Eucharist that we celebrate and receive.